I sent this one to Kathy for quilting. 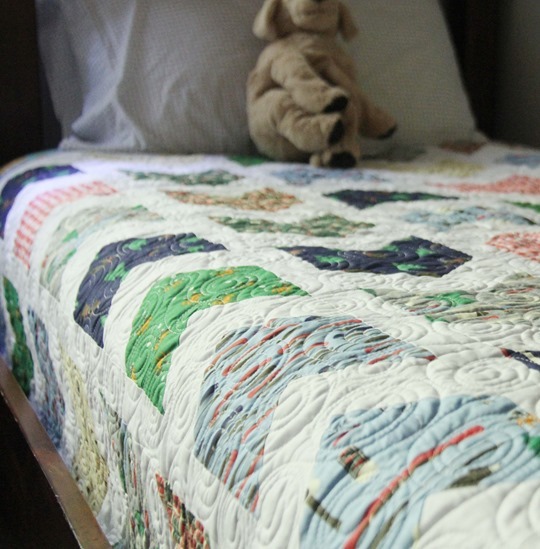 I love this quilting design because it adds some movement to the design but is still so perfect for boys. 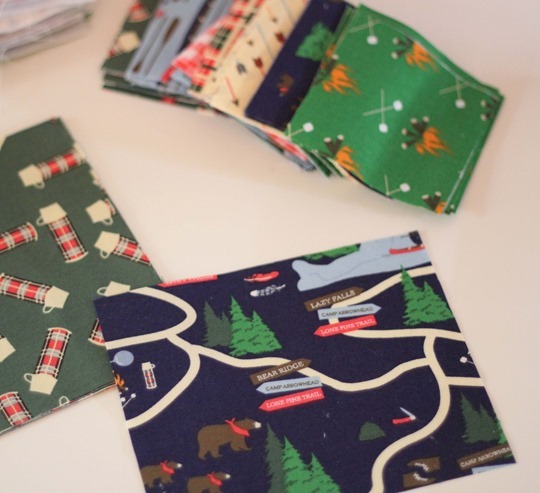 The fabric again is Take a Hike by Dear Stella, available now at quilt shops and online. The pattern is Pow Wow in my shop here…it’s the 4th or 5th time I’ve made this pattern?! All I know is I have a BUCKET of scrap half square triangles left over! 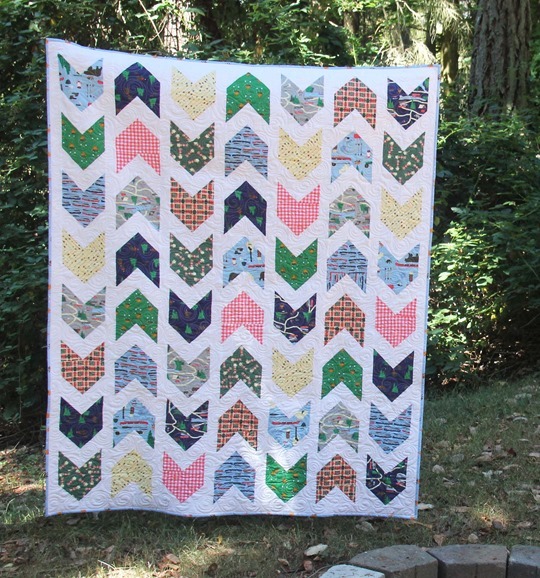 Such a darling quilt! Miss L's simply color Pow Wow is starting to get too short :( Such a great pattern! Cute fabric–this pattern never gets old! Love it :) This would be a perfect quilt for my parents RV. Love it!! And you're right- it makes for a perfect camping quilt! :) Have a great weekend! I was looking for crib/baby quilts on Pinterest last night and this pattern of yours jumped out at me, love it for it's brightness and many possibilities – including using up some stash. Everytime I see this quilt it makes me want to drop everything and make one just like it. Your pattern plus those fabrics equals very cute!! I've been needing a new boy quilt idea for boys who are "all boy" and this is a great one! Love the fabrics and the quilting design is a winner. Equally excited to see your fabrics & patterns while perusing Hancock's of Paducah. Cheers! Love your take on camping (both quilt & comments)…for me camping is a 2 star hotel! All that work…for fun??? Great quilt design, thanks for sharing! I love this fabric line and your quilt is perfect!! Love the quilt and fabric. Same goes here, everyone else likes to go camping. My idea of camping is a pop up or a camper, but it isn't in the budget yet. Oh well, guess I will have to rough it for a few more years. I think this is my new favorite quilt of yours! What darling fabric! The reverse fabric is perfect, a beautiful quilt! This is a great pattern, and I love the fabrics. I love this pattern and have it in my stash. Camping to me is a hotel, but be grateful you have a sweetheart and wonderful children to camp with. 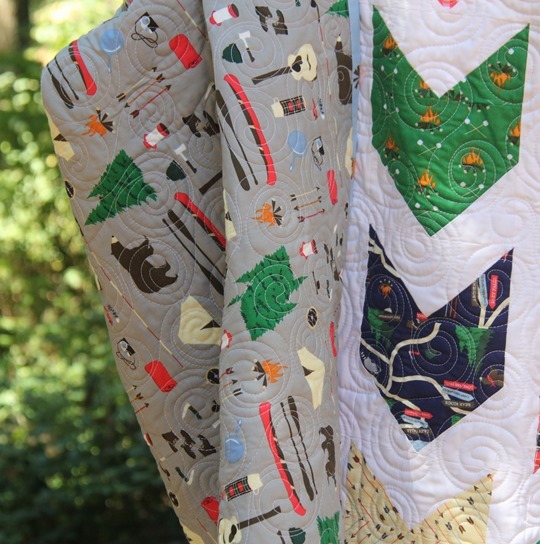 Such a great quilt design and I love this fabric in it! Great finish! Oh yeah, staying home to quilt – or renting a cabin – beats camping every time! Love this quilt and the pattern. I LOVE this fabric so much and it looks so beautiful pieced together in this quilt. I also LOVE this quilt! The pattern and the fabric. So cute. I'm definitely going to make a version. So cute!! Beyond cute! I love the white background. You are right, that is a perfect backing!! I love this pattern so much! I made one with Backyard Baby as a baby gift for someone. For some reason I can't find my pattern but I will buy the digital PDF next time so I always have a copy in my pattern folder! It's a true keeper and it looks fantastic in that camping fabric. I can't wait to make my next Pow Wow! I have been looking for quilt ideas for my two year old son, this would be great. Love the bright on white.